The recipes and spices for this box are high quality and have good variety. The only issue I had were that some of the recipes turned out a little bland for us. I loved my package of pre mixed spices. I am looking to make vegan dishes rather than the ones suggested on the cards. I will happily experiment! 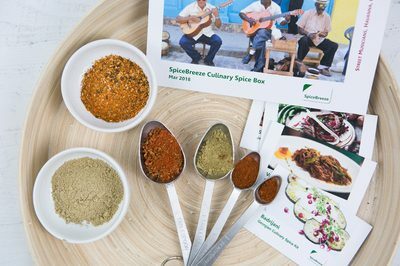 We usually love SpiceBreeze; unfortunately, this month we got the same spice kits as the previous month. I purchased the 4 per month subscription and was quite happy with the variety and quality of spices/recipes. My one "complaint" is that the recipe cards don't actually include the portions of individual seasons to be able to replicate the dish if you like it!?! Why discover new dishes if you can't make them again? This is the perfect kick I needed to try some new recipes at home. The spices are exciting, the recipes are (almost always) very easy versions of the dishes - which we greatly appreciate. I love the options in the recipes- if we can't find an ingredient there is always an alternative listed. Plus we love the funny stories or notes about the origin countries. Thank you and keep up the great work!